Piczzle Picture Puzzle service is an Internet-based sale and manufacturing service of Jigsaw Puzzles.We believe that capturing human experiences is sacred and for their memories to be fully effective and alive, they should always remain interactive. 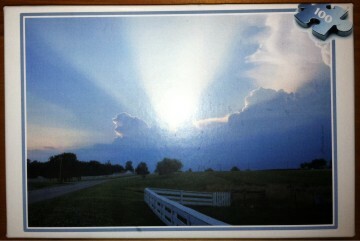 The outside of the puzzle box. Okay, you are probably already thinking "what's so special about a puzzle of the sky"? Well, let me tell you what. It's MY picture of the sky! I took this photo on a trip we took to southern Indiana last summer on vacation. When I took the photo I thought the sky looked so beautiful, I even had a few print copies made to see just how well my picture turned out. My husband and I knew what an awesome view it was and had always thought about doing something with it. 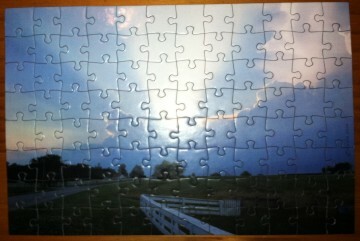 So when I got the offer to make a photo puzzle from Piczzle for a review I was so excited. I finally had something unique to do with my sky photo. And let me tell you I am so pleased with the outcome. You really have to see it for yourself to tell just how accurate and beautiful my photo is represented as a picture. And to top it off ordering was super easy! Just pick a puzzle size, upload your photo, and complete order! And if you so choose you can even add text or a border design to your puzzle. They even offer around and heart shaped puzzles if you're looking for something extra unique. Win it: One lucky reader will win a Custom Small 24-piece Cardboard Puzzle. This giveaway will end July 31st at 12:01 AM EST. The winner will have 48 hours to respond to my email. If no response, a new winner will be chosen. Open to residents of the US. What a bummer -- I really wanted to enter this giveaway -- but as usual the Rafflecopter came up 4 times saying Oh noes! It messed up. Plz try again. :( I wonder if the Rafflecopter really has it in for me or if others are having the same problems??? Photo puzzles can be made from any type of picture. We can use a family photo, a special drawings or paintings that our children have created, or any other type of image that we would like to turn into a puzzle. Puzzles are something, which we often played but playing puzzles of your own pictures and having them in some physical shape is a rare and very unique thing.